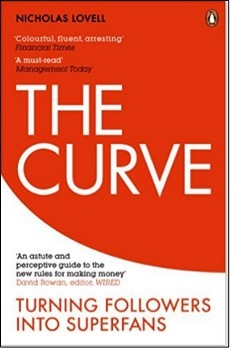 Download and read the free eBook ‘10 Ways to Make Money in a FREE World‘ from Nicholas Lovell, author of The Curve. I’m recommending The Curve to my consultancy clients in the creative and digital industries. This free eBook is a great short introduction to the The Curve. It contains specific references to creative industries subsectors including music, book publishing and computer games. This approach embraces the idea of a ‘Freemium’ pricing strategy, combining Free for many people with a few paying Premium prices for deluxe goods and services. What this means is, for example, make your game free to play, then add optional purchases to offer a range of extras for sale, including the option for true Superfans to spend lots of money. The same principle can apply to music, publishing and most other sectors in the creative industries – and beyond. Discuss this with creative entrepreneurs locally and globally on the T-Shirts and Suits Creative Enterprise Network.